READ BY EMILIA FOX. 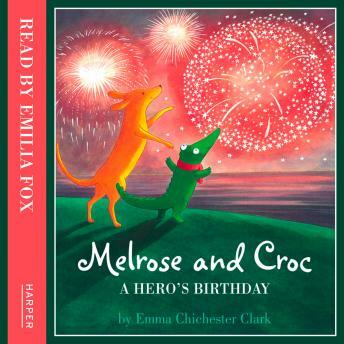 Melrose and Croc return in style in this beautiful picture book adventure, full of tension and drama, from the internationally renowned, award-winning author-illustrator Emma Chichester Clark. READ BY EMILIA FOX. Melrose has planned a wonderful birthday for his great friend Croc: a stay at a villa by the sea, a wonderful tea and a lovely surprise. As Melrose goes out to get everything ready, Croc sits and waits, and waits. Wherever can Croc be? Finally, Croc discovers that his friend is in danger, but will he reach him in time to save him?